Rich creamy vanilla bean custard topped with a crunchy caramelized sugar topping is the perfect easy creme brulee. Your guests will be so impressed! 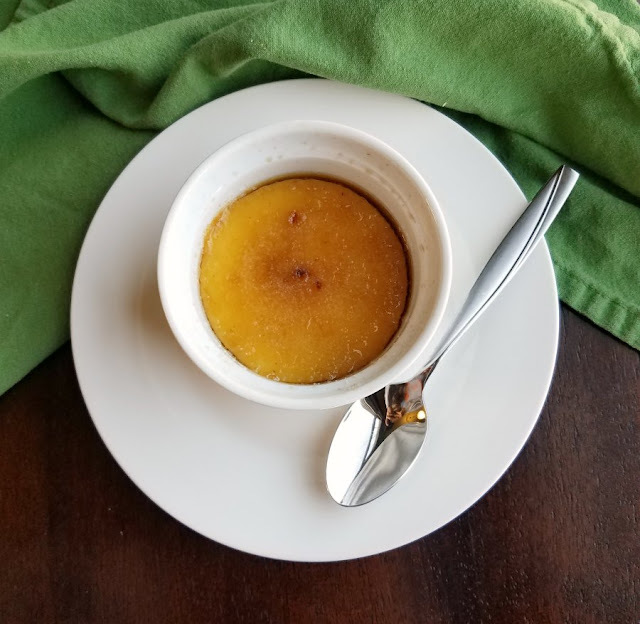 Serve creme brulee to your guests and they will know they are in for a treat. Especially if your brulee them tableside! 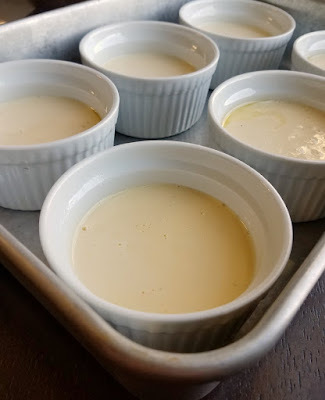 Make a simple rich custard ahead of time and all you have to do is top it with brulee sugar and crisp it with a torch or a broiler. 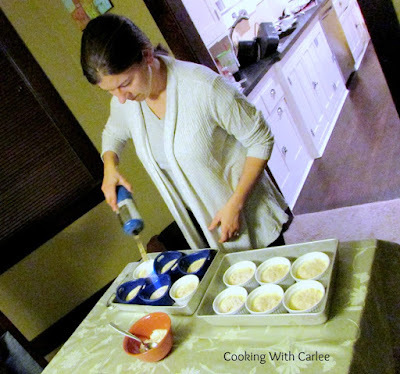 Hey everyone, Cooking with Carlee is a year old! A lot has changed in a year! When I started this little blog, I really had no idea what a blog was. I had never followed and blog and didn't even know I should do some research before jumping into the abyss. I had started the year with an email to family members asking for favorite recipes. I thought it would be fun to switch things up a bit, cook some family favorites and have a way to share with them with the people who had sent them to me as I did it. I knew just enough about blogs to know that would be a good way to do it. Then the craziest thing happened, I realized that people besides my family saw some of my posts. The more it seemed like other people were seeing some of the stuff I was doing, the more I wanted it to be a little bit better. The more time I spent doing it, the more I wanted people to see what I was doing. It was a crazy cycle. Then I learned about blog parties and joined a couple of fun blogging groups. Next thing I knew, I had a bloglovin' feed that is full of fun people's work and now I have Instagram, Twitter, Facebook and G+. It has been a lot of fun sharing some of my favorite memories and recipes. I have been having a blast trying some new things as well. MiMi has done a lot of pitching in with recipes and posts. If I had known more than nothing when I started this whole venture I probably would have named the blog differently. You know, something that required a little creativity and maybe opened it up a little bit. However a whole year in I don't know what the other name would be and I am sharing what I love. I appreciate each of you who have stopped in, especially those of you who have commented. I love hearing when you try a recipe and love it. I also enjoy reading your own memories and stories. I have gotten to know some other bloggers really well too. I feel a kinship with a special few of them and really enjoy reading what they have been up to. It is amazing how close you can feel to people you have never met. Mix together the vanilla bean paste, eggs, egg yolks and sugar. 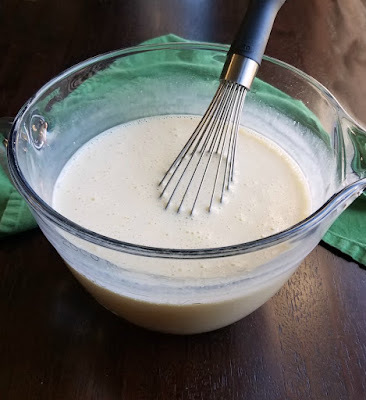 You want to whisk it pretty well so that the sugar dissolves. You don't want grainy custard. Stir in the milk and cream, again whisking well to get it all mixed. Set aside to let the air bubbles work themselves out while you prepare the dishes. Generously butter 12 ovenproof custard cups or ramekins. Place buttered dishes in a 9x13" pan or roasting pan. You can place paper towels under them to keep them from sliding if you wish. Pour the custard mixture into the prepared dishes. Fill a measuring cup with water as hot as you can get it from your faucet. Pour around in the roasting pan, around the ramekins to create a water bath. Bake for about 45 minutes, depending on the depth of the dishes you are using. You want the edges to be set and the middle to have just a little jiggle left. Remove from water bath and cool. Cover loosely with plastic wrap and refrigerate until completely cold, preferably overnight. When ready to serve, blot the top of the custards to make sure they are dry. Mix together sugar and brown sugar and sprinkle evenly over custard tops. Using a small kitchen torch (or Matt's big one!) caramelize the sugar, keeping the torch a couple of inches from the sugar and moving it back and forth until the sugar is melted and golden. 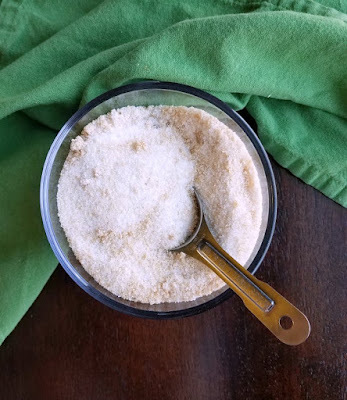 Allow the hot sugar to cool for 2-3 minutes then enjoy! Any bread or cookie gluten-free recipes or soy-free recipes. Thank you for your suggestions and good luck! Keep doing what you're doing! Keep the ingredients as real as possible. P.s. Sam was so sad to see that he missed creme brûlée! Ha! Sharadan, I'm sure you're a great cook. We'll have to do them again sometime soon. Congratulations on one year, Carlee! I'm so glad I've gotten to know you on the blogosphere, your recipes are always so delicious. That creme brûlée looks fantastic! Thanks Cristina! It has been fun getting to know you as well! Happy blogiversary Carlee! I love all of your beautiful baking and desserts so please keep that coming, too!! Thank you, Katie! I am sure there are plenty of desserts in the future! They are fun! I want to do a baked Alaska with it one of these days too! Another dessert I have never made! I love all the recipes you have shared, and look forward to what is to come. Thank you so much! They really are quite easy. Most of my siblings had never had one, so it was really fun to do! Thank you so much! It is so much fun to torch something, especially when it yields such tasty results! It is kind of crazy to look back at how we started and where we have come! It has been a lot of fun so far, though a lot more work than I anticipated to! Thanks so much for hosting! I love old recipes. Like your great grandmother recipes! Me too! I need to go to grandma's house to dig up some more! I have a few older ones left in my arsenal though. I can attest to this recipe being delicious. I had to come visit you for seconds the next day! We'll need to think of fun flavor combos to do next time! Congrats! Love all your recipes! Keep doing what you're doing! I love to see recipes with the freshest, healthiest ingredients! Thanks Ali! I love fresh and healthy too and of course fresh and maybe not quite as healthy too ;-) Everyone needs a treat every once in a while. Creme brûlée is one of my favorite desserts to make and I have my own torch! Congratulations on your one year Blogiversary, Carlee!! I can't wait to put our torch to use again! Thanks so much Kitty! Thank you so much Julie! I am glad we found one another too! This looks super yummy! That flame also might keep warm because well it is freezing here in NC right now! Thank you for linking up with us at the Tips and Tricks link Party! Cannot wait to see what you link next! They were so good! And we need all the warmth we can get this time of year. Thanks for stopping by! I've always wanted to try making creme brûlée (one of my favorite desserts! ), but the lack of torch has kept me from it. I guess a perk of being married to my brother is you never would have that problem. Can we *please* do this next time I'm in town?? Sure thing! It is handy to have him around sometimes! Happy blogiversary! :) I would love to see more seafood recipes, especially oysters. Thanks for the chance! Good luck! Oysters, huh? I'll have to do some work on that one. Living in a relatively small mid-western town, oysters aren't on the menu very often. But I would love to give it a shot! Oh my mom used to make these years ago and I don't think I have had them since. YUM! Thanks for joining us on the Creative K Kids Tasty Tuesdays Linky Party. We hope you will join us next week. I just love cracking through the crunch shell to get to the creamy custard! Thanks for hosting! I'd love to see more crock pot recipes, rich easy desserts, and quick week night dinners! Yum, yum and yes please! I will definitely get to work for you! I love casseroles! I've got one coming soon and will work on getting more together! Slow cooker meals for busy life! I do need to post more slow cooker meals! I will have to work on that! Wow...you make this look so easy! It really is easy! Thanks for hosting! We love Creme Brulee and this looks fantastic! Thank you so much for sharing with us at Full Plate Thursday and have a great day! Thank you for hosting, I always love seeing what you put on your plate! Congratulations on your blogging success! I didn't realise what I was getting in to when I started blogging either! Love the creme brulee too! Thank you! It is definitely a lot of work to keep the blog going, but it is a lot of fun too! I'm really late to this....but, Happy Blogiversary! Congrats on your first year. Mine is coming up in a few short months. Eeeek! Time flies. I've never tried making or even eating creme brulee, but you make it look easy so maybe I will now. Thanks Jessica, it is fun to see how far we have come in such a little time. 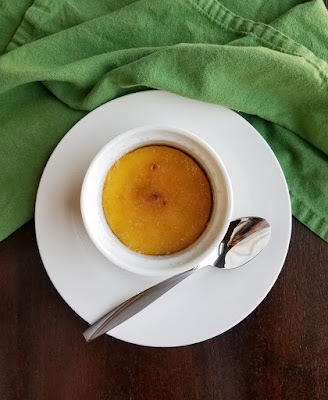 You should definitely give creme brulee a try!